There will be a Family and Youth Day at Our Lady of the Rosary Church, Blackfen, on Saturday 21st March. In the morning, we have our usual programme: Low Mass, (usus antiquior) at 10.30am, followed by Confession, Adoration of the Blessed Sacrament and Benediction at midday. After Benediction, there will be an address by Margaret Mizen, mother of Jimmy Mizen who was killed in May 2008. Barry and Margaret, Jimmy’s parents, showed a tremendous example of faith and peace-filled courage when speaking to the media after the tragic death of their son and it is a great privilege to have Margaret come to speak to us. A light lunch will be provided in the Hall and in the afternoon, there will be various talks and activities for children and young people as well as a talk on parenting by Greg Clovis. We will finish with prayers at 3.30pm followed by tea, juice and biscuits. Our usual Saturday schedule continues with confessions at 5pm and a Mass in English at 6pm. Sarah Gulliford is from Welling parish and appealed in various parishes of the Deanery for some sponsorship to enable her and friends to travel to Australia for the World Youth Day. Sarah has sent us back this great report on what was a wonderful occasion. If all you saw about it was on British TV, you need to read this to understand what really went on there in terms of helping the faith of our young people. Many thanks to Sarah – and do consider going to Madrid for the next WYD! After two years of planning and a huge amount of fundraising, on Saturday the 12th of July Emily and myself finally set off to Sydney in a group of 24 to represent the Sion community at World Youth Day. 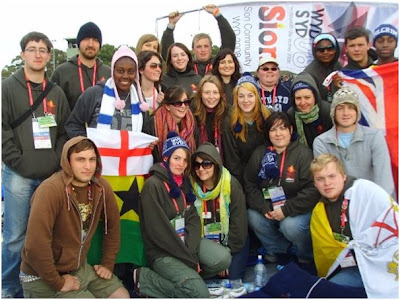 World Youth Day is an event thought up by Pope John Paul II and occurs every three years when young catholics from around the world come together to celebrate their faith and are joined by the pope in the last two days to round off the experience. The theme for this year was ‘You will receive power when the Holy Spirit comes upon you, and you will be my witnesses.’ (Acts 1:8) The event is growing each year, and despite Australia’s isolation from other parts of the world, 500,000 pilgrims travelled to Sydney for the chance to meet together. After a two long flights and a six hour stop at Hong Kong airport, we arrived in Sydney at 11 o’clock in the morning on Monday the 14th of July local time – 2am our time. Each group was assigned a parish within Sydney, which would be our base for the week and where we would receive three catechetical teachings from different bishops, all based around the theme for the week. Our parish was Our Lady of Good Counsel in northern Sydney, so we travelled there from the airport and had a barbeque as we chatted to people from other groups who were joined to the same parish as us. Many of these people were staying at the parish in the church hall, but due to us being a small group, we were lucky enough to be staying with families in the local area. Emily and myself stayed with a lovely family with two young children who called us ‘the pilgrims’ and loved doing impressions of our accents! The following day started with a trip to St Mary’s Cathedral, which had the relics of Blessed Pier Giorgio, who is known as the man who lived life in the imitation of Christ. His story is hugely inspiring, particularly to young people, and I would recommend others to look it up. There was then an opening mass at Barangaroo, which marked the beginning of the week. There were over 100,000 people at the mass and the sight of all these people gathered together was extraordinary. While we were waiting for the mass to start, groups from all over the world began to talk to each other, and a craze of swapping mementos with those from different countries ensued, which continued for the rest of the week. Cardinal Pell then started the mass, which included a parade of flags from every nation represented at the event, and a great deal of aboriginal dancing throughout which showed how proud Australia is of its cultural roots which I found rather touching. We also heard the world youth day song for the first time and the mass setting especially composed for the event which we knew off by heart by the end of the week. Following the mass, there was a concert with many performers and a firework display to finish. The atmosphere was already an amazing one the walk home, with groups from all over the world singing in different languages as they walked the streets of Sydney to return to where they were staying while waving flags and banners. The people of the city, particularly the police force, were shocked by the joyful but peaceful way the pilgrims conducted themselves throughout the week. How often do groups of youths meet together without some sort of trouble occurring? The theme of being a witness was already having an effect on those not involved in the week. On the Wednesday we started with our first catechesis from Bishop Brian Finnigan of the Brisbane diocese. Due to our tiredness one would think it would be hard to concentrate, but in actual fact we barely seemed to suffer from any sort of jet lag, and I found the talk to be very insightful. Following his teaching, we had a period of question and answering where we grilled Bishop Finnigan on the teaching of the church, which really opened up everyone’s minds to question certain aspects of our faith and understand why they were in place. In the afternoon, the organisers had put together around 5 events that we could choose to talk part in. Emily and I decided to go to see an American chamber choir at the Sydney Opera House – the tickets were free! – and we got a ferry into Circular Quay to reach the event. This took us past both the Opera house and Harbour Bridge and was a very picturesque way to enter the city, although extremely windy! The concert was incredible; the acoustics unlike anything I have ever heard and the choir entertained us with both religious and secular songs. That evening we then went to see a young English Christian singer called Tim Hughes, whose music our whole group had listened too and often used in worship, and who was playing to promote the youth alpha course. Although the venue a fair distance on the other side of the city, the evening was brilliant, with a huge concert hall of people praising together and our whole group felt extremely blessed to have attended. Thursday opened with another catechesis, this time for an American Bishop Joe who worked with the US Armed Forces. This teaching I found extremely interesting and his funny anecdotes and answers to our questions really stirred up the group and taught us a huge amount. After mass and lunch at the parish, we travelled into Sydney to watch the Pope’s arrival. As we were waiting, a huge game started in which around 200 people were running around in a circle together. It was strange to think that so many of these people taking part couldn’t communicate to one another but had been joined together by their faith. Once his Holiness arrived he made a very poignant speech, and many of the people I spoke to after said they found his points of how we could be a witness extremely inspiring. He then travelled around in his so-called ‘Popemobile’ and we got a quick glimpse of him as he drove past. Afterwards we decided to go to another concert, in the centre of Sydney by Catholic Canadian singer and his band, Matt Maher. This evening was one of the most spiritual nights of the week, and personally my life, as the venue was huge and filled to the brim with people worshiping. Halfway through the Eucharist was bought out and for so many people to be taking part in adoration as the band continued to play bought a completely different dimension to the evening which left me awestruck, and God’s presence could be so clearly felt in that concert hall. The following day we had the morning off, which many of us spent sleeping due to being so exhausted. We then travelled back to Barangaroo for an extremely moving stations of the cross. The reverence of the crowd made it all far more emotive, and many of those passing by in the street above found themselves unable to stop watching. We stayed at the same place for a ‘Receive the Power’ concert that night in which people such as John Pridmore, Father Stan Fortuna, Matt Maher and people from Hillsong church took part in, and this was, again, a very spiritual night. Saturday morning was an extremely early start where we met at the church at 6 am to start our pilgrimage to Randwick race course for the vigil and final mass with the Pope. Our group of 24 split into three and started the pilgrimage separately. It was a 3 hour walk from out start point and as we were walking we said the rosary together and prayed for friends, family and other intentions. All of you definitely had some prayer offered up for you that day! We also spoke about how we’d found the week and how our experience had been so far. Eventually, my group arrived at Randwick first and began to set up our area, as everyone was to sleep out under the stars after the vigil that evening. Soon enough, we had our own ‘Sion Camp’, and the Pope arrived in his helicopter. He then drove around the track in his ‘Popemobile’ and stopped straight in front of me to kiss a baby. He seemed slightly taken aback by the shouts of ‘BENEDICTO!’ from the crowd! The vigil then began, and was a great sight to behold. 500,000 people holding candles against the darkness of the night sky was incredible. Once the vigil had finished, we played a few games of cards and chatted, and then attempted to sleep despite the noise of people singing and playing drums into the wee hours. On the Sunday, we woke up early after very little sleep and waited for the mass to start. The music began and the mass, although long, was very touching. One moment that has stayed with me is when the Eucharist was bought out for a short period of adoration, and Pope Benedict XVI knelt down in front of the host and was helped up at the end. For such a holy man to be so humble really struck a chord with me. His speech at the end of the mass was also extremely deep and thought provoking. We sang the World Youth Day song for the last time together, and then made the journey back to our host’s homes. In the following week we travelled to Melbourne to work in St Francis of Assisi parish and it’s adjoining school, where we tried to give back through service what we had received the week before. This was extremely tiring, but very rewarding and spiritual in a different way to the previous week, and allowed us to really be witnesses of our faith following the theme of World Youth Day. All in all, World Youth Day 2008 was an amazing experience that Emily and I will remember for the rest of our lives. The time we spent there was extremely moving and there is no way we would have made it there without the support of everyone in our diocese, so thank you enormous amounts! We’re both going to World Youth Day 2011 in Madrid…who’s joining us? !